Cyberjaya University College of Medical Sciences (CUCMS) is a top-tier healthcare university in Malaysia; the latest SETARA ratings by the Malaysian Qualification Agency accorded CUCMS a Tier 5 (Excellent) rating on par with leading public universities. 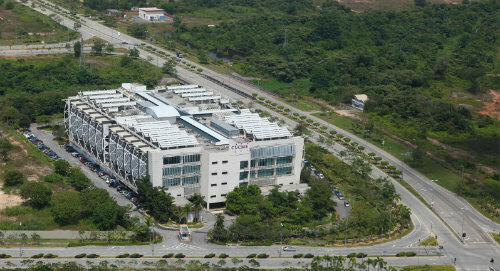 Established in 2005, the university is located in Malaysia’s first smart-city, Cyberjaya, on a 5 acre, modern, fully equipped, friendly green campus. Just a mere 20 minutes from Malaysia’s busiest gateway, the Kuala Lumpur International Airport and 30 minutes from the Kuala Lumpur city center, the campus is surrounded by lush greenery and provides a serene, conducive environment for student living and learning. Producing a holistic and competent professional is at the heart of what we do at CUCMS. Our vision and mission is to be a distinctive health sciences institution of international repute, with graduates who are intellectually, emotionally and ethically-balanced. From our humble beginnings in a small temporary campus with two programmes, the university has since grown in size and stature. CUCMS now offers more than 20 programmes including degree, master and doctorate level postgraduate research courses in a wide variety of disciplines including medical sciences, pharmaceutical sciences, psychology, physiotherapy, homeopathic medical sciences, and biomedical technology engineering among others. The university management is led by the President, Professor Dato’ Dr Mohamad Abdul Razak, who is a reputable Orthopaedic Surgeon Specialist; former Director of a leading public teaching hospital in Kuala Lumpur; Visiting Registrar of the Orthopaedic Department in Edinburgh University; Registrar and Spinal Injury Fellow of Southport Spinal Injuries Centre, Liverpool; and former President of the Malaysian Orthopaedic Association. Backed by over a decade of teaching excellence, we are staffed by over 200 industry-leading academicians and scholars who are committed to research and advancing human knowledge. Our professors and lecturers were former senior management, consultants and industrial professionals from leading organisations including the Ministry of Health, Malaysian Nuclear Agency, National Anti-Drugs Agency, Pharmacy Board and National Homeopathic Medical Council. Our academicians continue to form strong partnerships through industry collaborations and joint research projects. Our partners include leading pharmaceutical corporations and public research universities. The academic team’s vast knowledge, skills, and strong industry collaboration and networks have been instrumental in helping our graduates develop into successful professionals. A significantly large percentage of graduates are guaranteed employment upon graduation in the public healthcare sector while others continue to be at the forefront of the industry’s development with top private organisations. We have formed strategic alliances with the Malaysian Ministry of Defense and Ministry of Health that allow the use of their excellent facilities for clinical training. Other strategic partnerships include practicum training for our students with the National Academy of Homoeopathy, India as well as Pertamina Hospital in Indonesia that enable our students to gain valuable field experience. To help support the teaching and learning process, the University has invested heavily in providing a top-notch library with experienced personnel. The library collection includes over 30,000 books and hundreds of digital media for the exclusive use of our students. As a specialised library, it also subscribes to over 30 databases that provide our students with access to over hundreds of thousands of research papers, manuscripts and other digital reference. The University has over 30 different science laboratories for basic science subjects as well as specialised research laboratories such as Pharmacognosy Lab, Simulated Aseptic Room, Medical Sciences Lab, Biomedical Engineering Lab and Bioequivalance Drug Lab, among others. Distinct from the basic science laboratories where most of the teaching and learning is conducted, the graduate and research specific laboratories cater specifically to students who are conducting their research project for both graduate and undergraduate programmes. These labs are equipped with High Performance Liquid Chromatography (HPLC), Gas Chromatography (GC), Spectrophotometer, Gel Documentation System, ELISA Absorbance Reader, Microplate Washer, and Polymerase Chain Reaction thermal cycler (PCR). To ensure our students have first-hand experience in patient management, trained clinical skills instructors also conduct clinical skills sessions at any of our three Clinical Mock Wards which have been designed similar to a typical hospital ward along with teaching mannequins, electrocardiogram machines, and other hospital and surgical tools. Our students are introduced to human anatomy and systems using a full collection of realistically detailed plastic models at the Learning Resource Centre. For actual exposure to human parts, lecturers conduct sessions at our Human Dissection Hall which includes facilities for wet and dry dissection using approved medical cadavers. These resources have been put in place to provide the best in quality education and to ensure our graduates are fully prepared to face real world challenges. Our commitment to our students’ future is reflected in how we deliver quality education. Our teaching model creates an environment of active personal participation and involvement in group learning such as problem-based-learning sessions that enhance positive teamwork and leadership. We provide a holistic learning experience that emphasises on reflection sessions, peer, self and mentor feedback and folio records to ensure an all rounded assessment. The University Lodge is a 1,500 capacity residential hostel that provides students with a spacious apartment living environment during their years at CUCMS. The Lodge comes complete with a swimming pool, tennis court, basketball court, gymnasium, laundry mart, cafeteria and security office; and is situated next to a mall that provides students with all necessary amenities. A university shuttle bus service plies between the campus and the University Lodge which is situated a mere 10 minutes from the campus. To provide a rich university experience, the University works with various student clubs and societies in organising exciting events and opportunities for self-development. Our collaboration with MERCY Malaysia in forming a Young Mercy programme is unique among the universities in Malaysia as it allows our students to experience volunteer relief operations first hand. This disaster relief component is a part of the student curriculum which adds to the uniqueness of CUCMS. CUCMS provides Meritorious Entry Scholarships for our degree programmes. These scholarships are multi-tiered and are awarded based on the candidates’ entry qualifications. Various other bursaries are provided during special Information Day or Open Day intakes. You are encouraged to contact the University for up-to-date information on scholarships and other financial aid. CUCMS programmes are approved by the Ministry of Higher Education and accredited by the Malaysian Qualifications Agency. Due to our highly specialised and regulated courses, we have also obtained approvals by the various professional bodies including the Medical Council, Pharmacy Board, Medical Assistant Board and the Malaysian Homeopathic Medical Council. As a testament to our commitment to quality, CUCMS is now an ISO 9001:2008 QMS certified organisation. Our certification was provided by Malaysia’s highest and most reputable quality assessor, SIRIM.